Groceries are a necessity for living. The human body must have sustenance to function. Grocery costs are typically one of the highest annual costs for families, next to their home. Saving money with coupons is one-way families can reduce grocery costs. In the past coupons were typically found in newspapers and sometimes on product packaging. In today’s electronic world, coupons are available on the Internet and are even being transmitted to handheld devices via text messages and emails. There are many places to find coupons, from traditional hard copies to electronic copies that are both printed and sent via text. The following places are some of the more common coupon locations that offer a variety of grocery and retail coupons. Newspapers and other publications: Typically, newspapers have coupons on a weekly basis; monthly publications often have various coupons randomly placed within advertisements. Mail: Many companies will send out coupons in the mail to draw people to their products. Coupon websites: The Internet is flooded with coupon websites. Google ‘coupons’ or ‘grocery coupons’ and the amount of hits received is staggering. Often, all that is required is the installation of a piece of software that allows the coupons to be printed. Product Websites: Visit product websites and register to be on their mailing lists. Manufacturers will often send out coupons that aren’t available to the general public. Social Networking Sites: Twitter has announced it will be adding mobile coupons to its service. This will allow users to receive coupons on their hand-held device and use them in stores as they shop. Product Packaging: Product packaging often has coupons good for the next purchase printed on the label. It is a good idea to check before throwing away the box or label. Grocery Stores Aisles: Many manufacturers place coupons in the grocery store aisle in an attempt to lure customers to their product. Be on the lookout for these while shopping. 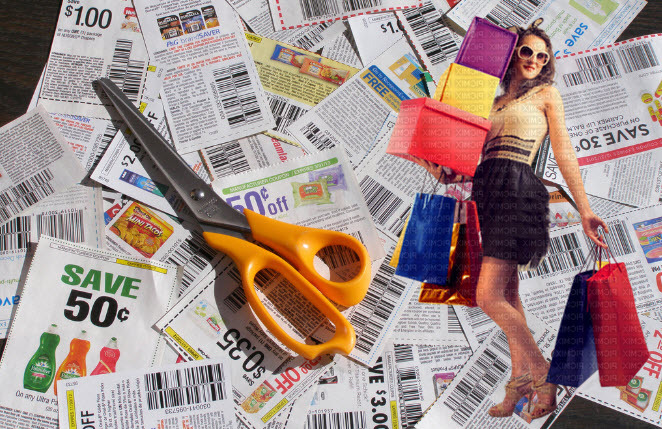 With so many places to find coupons, it is not unreasonable to imagine having a coupon for nearly every item being purchased. Now that the coupons have been located, they should be used to their maximum potential savings. Use grocer’s weekly advertisements to scan the sale items and match coupons to the item. Sticky notes are a good tool to keep on hand, place one on the coupon with the store name it is to be used at. Look for coupon specials. Many grocery store chains offer double coupons on a daily basis and triple coupons once a month. Grocers will typically only double or triple a coupon that is under $1.00; therefore, it makes more sense to use the coupons with the highest amount that can be tripled during triple coupon time. Don’t purchase something just because there is a coupon for it; if it’s not a regular purchase don’t buy it. The only caveat to that would be if using the coupon made the item free. For example, if the local grocer has Brand X barbecue sauce on sale for $1 and a coupon for $1 off Brand X is available, the sauce would be free. This is not an uncommon occurrence. Get the most out of buy-one-get-one-free sales by using two coupons. Theoretically, the purchase is two items, both at half price and so two coupons are allowed. From the example above, if the sauce were buying one get one free and the two $1 coupons are used, there would be a balance of $1 that would be deducted from grocery bill elsewhere. This is a great way to maximize the number of money coupons can save on groceries. Coupon research and clipping do take some time and effort. They have to be found, clipped or printed and matched to sale items to be worthwhile. However, seeing a grocery bill go from $90 to $35 makes spending that time a worthwhile effort. Error: Error validating access token: Session has expired on Friday, 12-Apr-19 14:10:09 PDT. The current time is Sunday, 21-Apr-19 11:57:33 PDT.